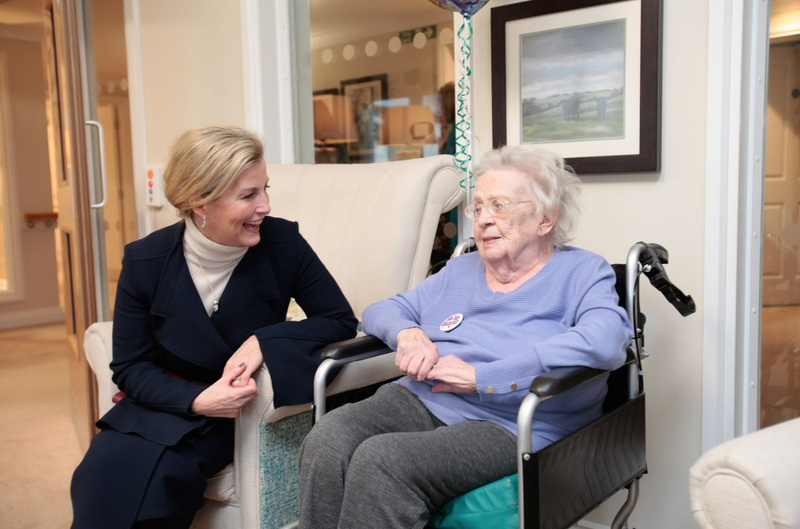 The Countess of Wessex as Patron yesterday attended the official opening of Brendoncare, Otterbourne Hill. Brendoncare is a charity dedicated to help improve the quality of life of older people. The Countess spent time talking with the residents. Sophie wore some familiar pieces for the engagement. The Countess wore her Roland Mouret ‘Millington’ coat. The navy wool-crepe wrap style coat has exaggerated open notch lapels exposing a deep v-neckline, long sleeves ending in some very oversized bell cuffs, an a-line skirt to a midi length. The coat is cinched in at the waist with a wide belt with a rectangular buckle and there are two slip pockets on each hip. The rear of the coat shows detailed sophisticated tailoring for a sleek look. This coat is no longer available as it is a past season, though you can still view some details here. Try this great coat to get Sophie’s look here. The Countess wore two unfamiliar pieces: an oatmeal coloured roll neck jumper – probably a wool-cashmere mix – and pencil trousers in navy. Sophie’s coat shielded the details of these pieces, but we know that Sophie often wears Max Mara jumpers. Try this roll-neck jumper to get Sophie’s look for less, here. Sophie wore a pair of mid-calf black leather chelsea boots with block heel. We believe these boots could be either Prada or Saint Laurent. Let us know what you think? The Countess carried her Sophie Habsburg contrasting grid clutch, in a mix of leather and suede. This trapeze style envelope clutch shows the main body of the clutch to be red and purple leather with the small flap in burgundy and lilac suede. Quite and unusual yet intriguing colour combination. This clutch is not available for purchase but has been added to a photo on Sophie Habsburg’s instagram account. You can see Sophie’s bag in the centre of the table. The Countess also has an identical Sophie Habsburg clutch in a different colour way. A closer view of Sophie’s clutch. Sophie accessorised with her Martina Hamilton ‘CROI Sliogan Designer Silver Drop Earrings’, retailing for £68. Sophie was gifted these earrings last year on an official visit to Ireland. These silver wire wrapped cone shaped earrings are inspired to look like the hearts of shells, or the inside of a shell. You can purchase Sophie’s earrings here. Try these earrings to get Sophie’s look for less, here. Sophie also wore her Patrick Mavros ‘Hippo Splat Silver Pendant & Chain’, retailing for £195. This very fun shaped necklace shows a large hippo seeming to dive down off the long silver chain. It reminds us of the dancing ballerina hippos in Disney’s ‘Fantasia’. We love this unique piece. Sophie has had this necklace for awhile and worn it on a few previous occasions. You can buy this interesting necklace here. Or try this similar piece here.